Handmade Oriental rugs come in all shapes and sizes, but they also vary in quality of craftsmanship and materials to a great degree. Knowing this, it’s important for those interested in purchasing a Persian, Oriental or Turkish rug to have a fundamental understanding of what to look for before spending hundreds or even thousands of dollars on an investment. As you begin your search, here are 5 things to look for to ensure you’re purchasing a high-quality, handmade Oriental rug. There are a wide number of machine-made and hand-tufted rugs available on the market. Yet, without exception, they clearly lack the quality and rarity of handmade rugs. So what really is the difference between the two? Put frankly: uniqueness. Machine-made and hand-tufted rugs work from a designated pattern, meaning the rugs are mass-produced and are inseparable from one another in terms of look and feel. Handmade rugs, on the other hand, are produced by artists who work from a drawing to create the finished piece. Each one of these exhibits a profound uniqueness, in spite of minor similarities between rugs produced by the same weaver. Handmade Oriental rugs are typically woven together using wool and silk. 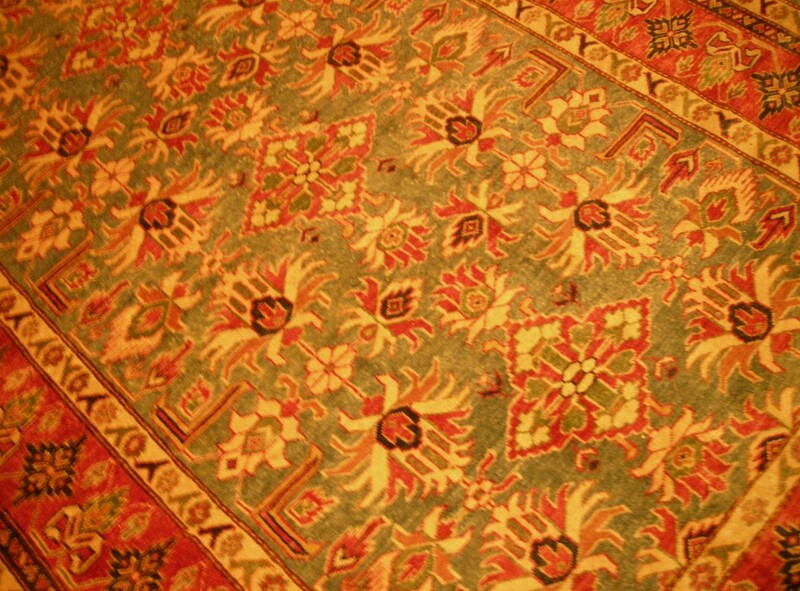 Inferior rugs will often claim to be made of these materials, but are usually found to contain rayon or viscose as a replacement for silk, or substandard wool that lacks a natural glossiness and suppleness. When it comes to a rug’s dyes, colorfastness is key to knowing whether or not the dyes are of the finest quality. When examining a rug with a dealer, ask them to test the rug’s dyes by running a clean, damp cloth over the fibers. If the color attaches itself to the cloth, you’ll know the dyes are either cheap or not integrated well into the rug – and potentially missed the all-important rinsing process after the rug was produced, which indicates a hurried process. A rug’s knots-per-square-inch (or KPI/KPSI) plays a tremendous role in its overall value. While a rug’s appeal in terms of its design and coloring is important, the higher the knot count, the more these designs and colors show with greater clarity. And in Turkish, Oriental and Persian rugs, clarity is often king. By examining the back of the rug and selecting a square-inch of space, you can measure the number of knots in that particular area by counting the number of knots going upward then sideways and multiplying these two together to get the KPI. Coarsely knotted rugs typically fall below 100 KPI, while more finely knotted rugs – which are more valuable – go anywhere from 100 to 1,000 KPI. Knowing what to look for in a dealer is just as critical as knowing what to look for in an Oriental rug. If you’re looking for an authentic carpet for your home or office, be sure your search includes a visit to an actual showroom versus only buying an Oriental rug online. Or at the very least, ensure your dealer is an authority on Oriental rugs by looking beyond what rugs are for sale on their website by digging into their knowledge and history on the subject. Becoming educated on Oriental rugs beforehand does help a great deal, but dealers should also be willing and able to answer questions about a rug’s country of origin, age, KPI and possibly even the artist who produced the rug. If a dealer appears to be stumped on many of these details or you feel like you’re getting the runaround, then it’s best to move on to another dealer altogether. Before you invest in a handmade rug, know where your rug is going to be displayed in order to narrow the field of potential carpets you will be searching for. Whether you’re looking for a room-sized rug, runner or a handmade carpet for your bedroom, living room or dining room, be sure to follow our guide on How to Find the Right Sized Oriental Rug for Any Room. Have any further questions about handmade Oriental rugs? Visit our showroom, fill out our online form or give us a call to speak with one of our rug experts. We are happy to help you with anything rug-related, including rug appraisals, rug cleanings and rug repairs.